Say hello to the newest UB Poker pro Prahlad Friedman! UB Poker officially announced the signing of Friedman today –although it was one of the worst kept secrets in poker over the past week—with an extensive blog entry including a welcome interview with Friedman. 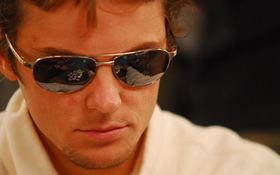 Friedman’s picture is now prominently displayed front and center on the Team UB Poker page, taking the place of one Phil Hellmuth, who recently parted ways with UB Poker, along with Annie Duke, after nearly 10 years. This signing of Friedman has not been without controversy, and many poker players and fans have expressed their displeasure with the man who formerly shunned online poker sponsorships. Friedman’s biggest critic over the past week has been Daniel Negreanu, who rekindled his long held hatred for anything UB Poker, and took to his Twitter account to roundly criticize Friedman’s decision to join UB Poker –and in doing so further confirmed what we all knew; that Prahald was signing with UB! As well as Adam “roothlus” Levy, Anthrax rocker Scott Ian, Bryan Devonshire, Gary “DEBO34” Debernardi, “Hollywood” Dave Stann, and Mark “Poker Ho” Kroon. I wouldn’t be surprised to see more signings in the near future, as UB Poker has freed up a lot of capital to pursue unsigned poker pros by parting ways with Phil Hellmuth and Annie Duke. This entry was posted on Friday, January 7th, 2011 at 6:07 am and is filed under Poker News. You can follow any responses to this entry through the RSS 2.0 feed. You can leave a response, or trackback from your own site.